As demands for demonstrating impact are increasingly woven throughout the funding and institutional architectures of higher education, concerns have been raised that the impact agenda could adversely affect critical and blue-skies research, favouring instead research that lends itself more easily to societal uptake. Ahead of REF 2021, Ruth Machen considers what impact from critical research could look like and how assessment frameworks could support, rather than squeeze out, space for critical research. 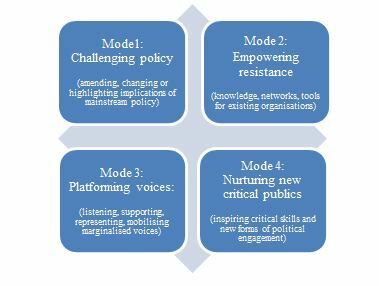 Four modes of critical research impact are outlined: challenging policy; empowering resistances; platforming voices; and nurturing new critical publics. The typology presented here is basic, provisional, and by no means exhaustive. Its goal is to prompt debate and expand possibilities for thinking about critical research impact. With similar conversations reportedly held at Open (2013), Bristol (2013), and Glasgow (2015) universities, it would be great to hear more about these discussion findings – especially in thinking through forms of impact beyond policy. Featured image credit: Paul Skorupskas, licensed under a CC0 1.0 license. Ruth Machen is a Research Fellow at Newcastle University. Her research on science-policy interaction focuses on environmental knowledge where her recent work takes a critical look at science-policy translation – Towards a Critical Politics of Translation.